Denny Jump (Bellevue, WA, United States) on 19 February 2012 in Landscape & Rural and Portfolio. Sifting through some old images, I came across this old favorite of mine. 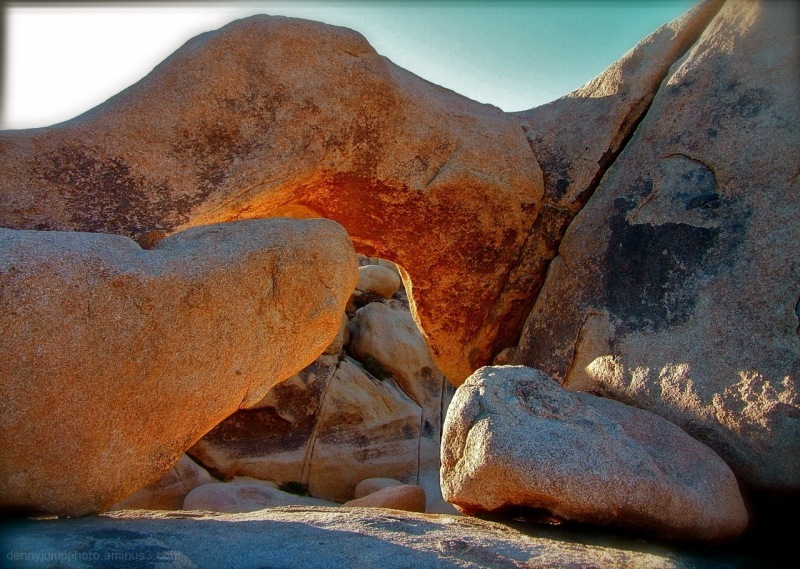 Early morning sun glows thru a granite archway, shaped by eons of wind, water, and seismic activity. Joshua Tree National Park is truly a wonderful place! Beautifull structures and colours, good light effects. I like it! @Richard: Ha ;-) Funny you should mention that becasue my good old pal, Stephen Holsapple I believe knew Gram a little bit while Gram was with the Flying Burrto Brothers. Steve is an Artist, Musician, Songwriter, Film director, all around beautiful person whom i have known since high school days. Still living in Sacramento, CA and working in media production. I hope your projects are going well...think about you lots ;-) Thanks Richard..
lovely tones, what a beautiful natural arch. I love to explore places like this. The light on the archway is fantastic! Beauty of a shot, Denny! Excellent light indeed, bathing this with a warmth that translates wonderfully in your lens. Wonderful light and colors !!!! Great shot..
A really beautiful natural sculpture Denny. The colours & contrasts caused by the light are superb. Gorgeous warm light and rock details! We drove by Joshua Tree NP but didn't have time to stop; now I'm even more sorry. I can see why this is a favorite image, Denny. Beautiful shot, Denny! I agree that this park is wonderful. Interesting composition. Great colors, shapes. OUTSTANDING! Beautiful light, color and textures that come together very nicely! Fabulous shot, Denny - the warm light and textures place us right in this beautiful scene! Great shot. I remember other shots from there. Wonderful shot. I love the warm colour and the texture on the rocks. Beautiful warm sunlight captured here! Great textures in the rocks as well. Excellent shot Denny, capturing the light and colour very well. Just thinking that a tighter crop of this one (losing the sky) would really help to make those colours just jump at you.